UPDATE: The deadline for this contest is Monday, June 8th. Rockstar Games has opened up the first video editor contest. The goal is to make the official music video for the Wavves song "Leave" - off the Alchemist & Oh No Present: Welcome To Los Santos album and the new in-game radio station The Lab. The song is about leaving a bad situation. Whether that means a criminal enterprise or activity, or a bad romantic relationship, or something else entirely is up to you to interpret as the music video director. Just have fun with it and don’t be afraid to get a little weird along the way. To fire your creative juices, here's the track for you to listen to. As well as the prestige of having your masterpiece selected as the track's official music video, the grand prize winner will receive a custom G910 Orion Spark Gaming Keyboard and G510 Proteus Core Gaming Mouse both of which come laser engraved with the Rockstar Editor logo as well as your own personal Social Club ID to make it a truly one-of-a-kind bit of kit. The G910 Orion Spark Gaming Keyboard features ultra-responsive mechanical keys and Logitech’s Intelligent Illumination. 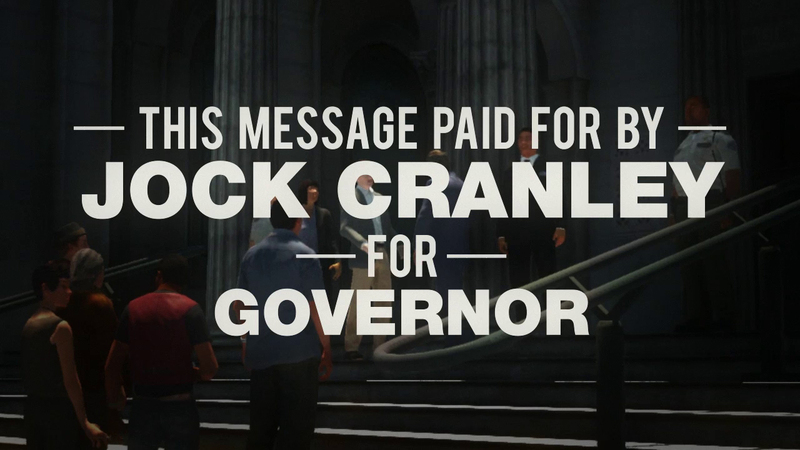 Fully supported by GTAV PC, the backlit keys match the signature color of the character you’re playing as while in Story Mode dynamically (blue for Michael, green for Franklin, orange for Trevor), the function keys flash red and blue when you have a Wanted Level, and a custom profile can be setup to backlight only the relevant keys while using the Rockstar Editor. The G510 Proteus Core Gaming Mouse features 11 programmable buttons, customizable weight and five selectable DPI settings, from headshot-precise 200 DPI targeting to lightning-fast 12,000 DPI maneuvers. As if that's not enough, the Winner also receives a deluxe prize pack of awesome official GTAV gear and a $100 gift card at the Rockstar Warehouse - which can be used on anything currently available, including rounding out your Rockstar Digital Download collection, expanding your Rockstar wardrobe, or upgrading your GTA Online vehicle fleet with a Megalodon Shark Card. Two runners-up will each receive a $100 Rockstar Warehouse gift card and a deluxe prize pack of official GTAV gear. The winner and the two runners-up will also be featured at the Rockstar Newswire. The video must feature the song "Leave" by Wavves as its soundtrack, and only that song. Your video must be between 3 and 5 minutes in length. The video must be published to Rockstar Games Social Club and tagged with the word 'leave' between now and 11:59pm ET on June 8th to be eligible. For legal reasons, only residents of certain countries are eligible to win. The video must be made entirely using the Rockstar Editor. Rockstar knows that many advanced Rockstar Editor video creators like to use additional third party editing software but in order to keep this competition fair for all entrants, they require that you only use the Rockstar Editor in producing the video. 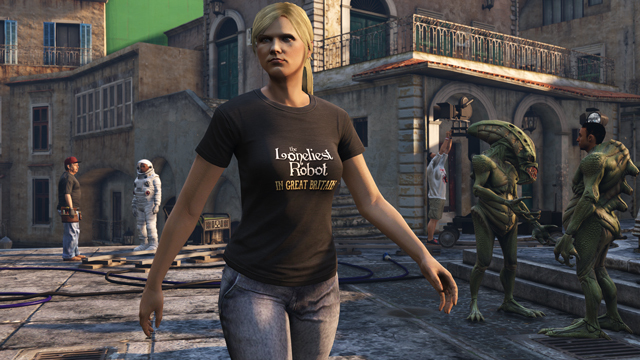 Even if you don't win, every Social Club member worldwide who uploads any video to Social Club (not just entries in the competition) during the contest period will unlock an in-game t-shirt bearing the logo of the Vinewood blockbuster hit The Loneliest Robot in Great Britain. Please note that the t-shirt will be awarded after the contest ends in early June, so please don't expect it to appear as soon as you upload a video! And for those who haven't seen it yet, The Loneliest Robot in Great Britain is on an extended run at the Tivoli, Ten Cent and Oriental Theatres in downtown Los Santos right now. Wavves and Rockstar Games will pick the winning clip taking into consideration adherence or interpretation of The Creative Brief mentioned above, entertainment and artistic value, editing quality and overall creativity. Watch the Social Club contest page to see how other Social Club members think your clip stacks up against the competition and stay tuned for the winners announcement this June. Good luck and share your videos in the forums! The deadline has been set for this Monday, June 8th. 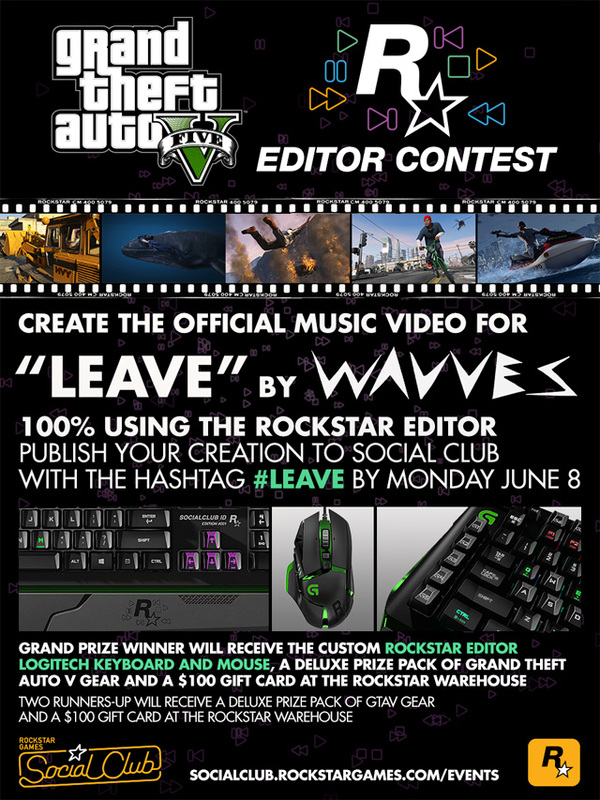 Rockstar Editor Contest: Music Video for "Leave" by Wavves - The first video editor contest is going on right now. Rockstar Games wants to see a music video for "Leave" by Wavves.